The Wireless Networker 802.11a/b/g family of client adapters from Symbol Technologies delivers enterprise-class high-bandwidth wireless connectivity for laptop and desktop computers. Available in CardBus and PCI form factors, the Wireless Networker client adapters offer maximum flexibility, integrating seamlessly into wireless switch and access point-based wireless networks. 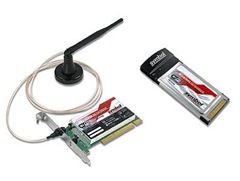 Supports Wireless Networker 802.11a/b/g CardBus and PCI adapters. Models: LA-5030 CardBus Adapter and LA-5033 PCI Adapter on Windows 2000, and Windows XP. The Wireless Networker 802.11a/b/g Software Bundle includes updated drivers, integrated firmware, an updated User's Guide and the configuration utility for network configuration and monitoring. Note: Please refer to the release notes file for more information on this release, including installation instructions. Device Name: "Symbol LA-5030 Wireless Networker 802.11a/g CardBus Adapter"
Device Name: "Symbol LA-5033 Wireless Networker 802.11a/g PCI Adapter"